Wednesday (12/7/2016), the Media Specialist at one of my high schools, Nan Lanford, and I put on a BreakoutEDU experience for the staff during all four planning blocks. We each heard about BreakoutEDU earlier this semester, and we have been excited about the possibilities of bringing this experience to the teachers and (ultimately) the students. BreakoutEDU is a learning game based upon the recent escape rooms wherein participants are locked in a room and must solve multiple puzzles in order to break out within a certain time frame. The primary focus in these games is building teamwork and collaboration. For our staff experience, we utilized Dr. Johnson's Lab: Zombie Apocalypse. This was largely due to the fact that we are both HUGE fans of AMC's The Walking Dead. In the week before the experience, we created a graphic in Canva to "hype" the experience and had student aides post these in faculty bathrooms. Nan also sent out multiple staff emails and secured various "red herring" items to include in the setup of the game. The morning of the experience, Nan and I sat in the Media Center anxiously waiting to see if anyone showed up. At one point, I looked at Nan and said, "We are just going to have to trust God that people will show up." My main concern at that point was that Nan had put SO much work and heart into this experience, and I was terrified that we would be alone. Everyone needs validation, and I really wanted Nan to receive hers. She is a truly inspiring Media Specialist and an overall amazing person; I am blessed to work with her on a regular basis. Five minutes into first block, we had one teacher. Soon, two more showed up. Nan read the introduction story and explained a few rules, and we began. All three teachers seemed a little hesitant initially. This hesitation quickly disappeared, and when another teacher passed through the Media Center, all three teachers pulled her in to participate. When the teachers solved the puzzle, they were excited. One teacher scheduled BreakoutEDU experiences for her classes for next week. As we checked email in between planning blocks, we found an email from one of the participants recommending that the staff give themselves the "gift of participation" in BreakoutEDU! Overall, this was an absolutely amazing time. It has been my experience that high school teachers can be somewhat clique-ish. As a former high school teacher, I can honestly say that I spent most of my time with teachers in my own department. BUT Wednesday, teachers and administrators from multiple areas were engaged and communicating and collaborating with each other. My hope is that as we move forward with BreakoutEDU, we will continue to build community - within classes AND acrross the faculty. Happy teaching with tech, my friends! In a meeting a few weeks ago, I was completely surprised by a young teacher's comment that he did not like using technology. At all. I was shocked. He said he did not see a reason to use it and preferred to utilize lecture and book work. Double shock. How was this possible? A young teacher would not be who I expected to fight me on technology. He had grown up with technology - it shouldn't be intimidating to him. As it turns out, it wasn't that technology was intimidating to him; he just didn't care to use it. He saw no value in it. So I was left with the question - why do I use technology? When I graudated with my Bachelor's in Secondary Social Science Education in 2006, I left school confident in my decision to not allow phones in my classroom. I had been trained that they were distractions, and with good classroom management, I would be able to avoid having students distracted by them. That lasted for approximately one year. I spent a LOT of time my first year fighting the overwhelming tide of technology crashing into my classroom. During my first summer "break" (that I spent most of training on how to be a more effective teacher), I spent some time reflecting on whether or not this fight was worth continuing. I began to wonder if maybe the key to technology was to just embrace it. I have always been fairly tech savvy, and I have enjoyed technology ever since elementary school playing Oregon Trail on the Apple IIe (see this article for GREAT pictures of those dinosaurs). So maybe technology wasn't really the horrific corruptor of children's minds that I had been led to believe. All of this became a springboard into the position I moved into approximately a year and a half ago. What I have found over the years through my own battle against and then for technology is that technology has the capability to make your classroom more efficient, your students more engaged, and your teaching life more exciting and more engaging for you. However, true integration of technology becomes a transformative element in your classroom. If you were doing worksheets all of the time and you have moved to doing worksheets digitally, they are still worksheets. Contemplate using technology to move yourself one step up. It is not necessary for you to use all of the technology immediately. It's perfectly fine (and much more practical) to incorporate a few things at a time. As Vicki Davis said in her recent keynote presentation at GaETC in Atlanta, Georgia, innovate like a turtle. ​Happy teaching with tech, my friends! Picture created using Meme Generator with special thanks to Allie Brosh for the original image. Thursday was another great day at #GaETC16! I presented at 4:30 p.m. on Multiple Tech Tools for Social Studies. Below is the handout for this presentation. What I have to say that I value the most about conferences like this is the true collaboration between teachers. It's one of the only times I see teachers have the time to sit and talk. While some of this seems like simple socializing, it rarely is. When you get close, you hear amazing things. Teachers, I believe, are inherently social, and we draw strength from collaboration with others! I want to really thank all of you who came to my session. I know it was late in the day, but I so much appreciated the time spent learning together. Friday brought time to connect with more educators. Big thank you to my friend Kenya Ransey (@kenyaransey) for her patience in teaching me Voxer and adding me to some great groups. I am already learning so much. 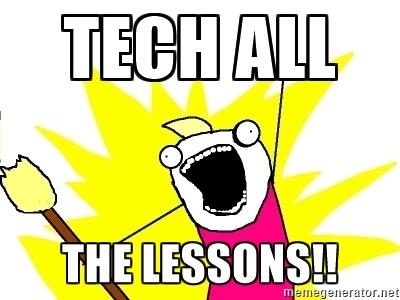 Happy teaching with tech, y'all! What I also loved about Josh's presentation was his focus on making learning fun again. So often, I think we lose sight of how amazing kids really are. We take students who LOVE to learn at age 5, and by age 16, many are sick of school. Sir Ken Robinson speaks to that in his TED talk on how schools may be killing students' creativity. Another session that I particularly loved was hearing Tony Vincent talk about "The Wonderful World of Widgets." Readers beware, after hearing that talk, you may be seeing WAY more widgets on this site. Special note on this one, because of Tony, you will see no "suggested videos" following Sir Ken Robinson's talk above. To make this happen on your own blog, simply find a YouTube video, click Share, then Embed, then Show More. Scroll down and uncheck "Show suggested videos when the video finishes." WhiteBoard Animations: Presentations Are Fun Again! One area I have always struggled with is spatial reasoning. My family and friends have found it amusing over the years as I consistently get lost coming and going to even familiar places. I had a difficult time in the classroom because I would see a great design for desks that would greatly help facilitate collaboration, but when I tried to implement it, things would go horribly awry. It never failed - I always wound up with not enough room for way too many desks. Growing up, my Dad would pick me up from a youth group meeting and casually ask me how many people were there. I had no idea. It could have been 5 or 50. I had no way to estimate and was left with simply counting the people so that I knew I would have an answer. With all that being said, I have really LOVED whiteboard animations. My fascination with them began when I first saw the RSA Animate of Sir Ken Robinson's TED talk on Changing Education Paradigms. The brilliant illustrations completely brought to life Robinson's conclusions on how education needs to evolve. I felt envy. True envy. Not only am I not spacial, I am also not gifted with an ability to draw anything. Even my attempts at stick figures are disappointing. I have accepted this inadequacy and made my peace with it. However, that has not stopped me from dreaming that I could do something like the whiteboard animations that RSA Animate does. Enter VideoScribe. VideoScribe is a program by the United Kingdom company Sparkol that allows ANYONE to do whiteboard animations! They offer a free trial so that teachers can experiment with the animations. Included within that free trial are a large number of different animations that can be pulled into the video. Additionally, free music is available, and you can record your voice to explain the concepts to your students. I decided to give it a shot. I took several hours and just played. I did not really have a purpose when I started, but as I played, an idea developed. I would create a video highlighting the amazing things happening in a school I was serving at the time. As I mentioned above, I struggle with spatial reasoning, so understanding that the board was not limited to my screen, and in reality, was infinite was difficult for me. However, the final product turned out great and has been used to promote the school. If you have been curious as to how these whiteboard animations are developed, I would really encourage you to sign up for a free trial with VideoScribe. Playing with this program has been fun, and even my husband is using it this week for a project in his education class! Thank you to all of you who attended today's session and stuck it out even though there was no projector! I had a great time with all of you! What a wonderful session of collaboration. David Geurin (@DavidGeurin) stated, “Classrooms don't need tech geeks who can teach, we need teaching geeks who can use tech.” Given that, there is no more important goal to me than to provide an easy transfer for teachers to new technology. One amazing thing about Spiral is its ability to import existing PowerPoints for ease of transition. This is accomplished utilizing the Discuss app within Spiral. With Discuss, a new presentation can be created OR an existing PowerPoint can be imported. While there are some size restrictions on these imports, I have found them to be fairly reasonable. Once the PowerPoint has been uploaded, questions and tasks can easily be added to the presentation. Much like Nearpod, the teacher has control over the students’ devices, and when questions and tasks come up, the students’ devices are paused so that focus can be directed to the task at hand. An old saying, "Physician, heal thyself" came to mind. I had been so busy sharing what I just knew was beneficial knowledge with all of you amazing readers that I neglected to give myself time between webinars to reboot. Thank God for having an extra presenter who always answers her phone! I am a Technology Training/Integration Specialist for a public school district north of Atlanta, Georgia. I am passionate about supporting teachers and students in transforming their classrooms using technology. I am a firm believer that technology should not be a special occasion; rather, technology is at its best when it is a seamless part of our everyday actions.